When you look at James and Dillon, you can tell right away that they are brothers. With siblings, there’s that unspoken rule that siblings can pick on siblings, but others can’t without repercussion. Well James is definitely the protective big brother, while Dillon tends to be picked on by others. They are your typical teenage boys. James is athletic and is described as well-mannered and friendly and takes direction well, while Dillon is funny and a band member that can get frustrated easily. They’re somewhat night and day, but when it comes down to it, they both want the same things: a forever family…and a dog! 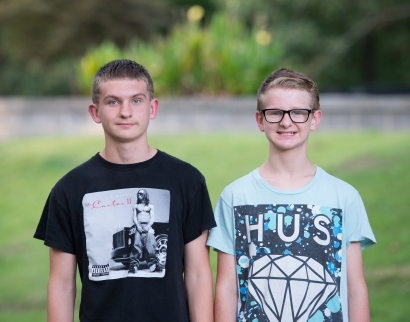 James worries about his and his brother’s futures if they don’t get adopted and Dillon simply wants to be adopted and share with the world how awesome he is. They need a loving forever family that can provide a structured and patient environment. Dillon and James both are open to having more siblings, as they do well with other kids and would love a full household of siblings, parents and pets. James enjoys going to church as well and they both love pizza. Why not fill out the form below to see if maybe a large pepperoni and cheese could be the start of an amazing relationship of two boys and their forever family.